Is there a chart that shows how to raise a Pokemon's happiness in Platinum? 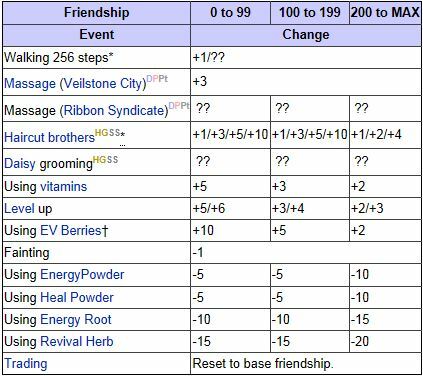 Here is the happiness chart for Generation 4. As you can see, some of them only apply to certain games. You can do all of these things except the Haircut Brothers and Daisy Grooming. Some actions lower happiness instead of raising, so be careful to avoid them. What about items such as HP Ups, Carbos, Proteins, Irons, Zincs, and Calciums? Does using those increase happiness as well? Those are vitamins, and the chart says that using vitamins will boost happiness. So, yes. Oh, sorry. I figured that's what they were, but I wanted to make sure. Thank you! Is there an easier way to raise up a Pokemon's happiness in gsc? Do Poffins raise a Pokemon's happiness?